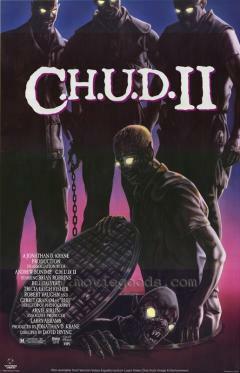 Today’s feature is truly one of the most unnecessary and strange sequels of all time: C.H.U.D. 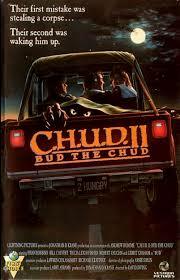 II: Bud the Chud. C.H.U.D. II was written by Ed Naha, who also penned such movies as Troll and Dolls. However, he did so under a pseudonym: M. Kane Jeeves. The fact that a man who was willing to have his name on Dolls and Troll declined credit for C.H.U.D. II should say a lot about the sort of movie we are dealing with here. The film was directed David Irving, who has directed such films as (Night of the Cyclone, Rumpelstiltskin, Sleeping Beauty). However, he had no previous experience with directing horror movies. The cinematographer for C.H.U.D. II was Arnie Smith, who has primarily worked on biographical documentaries like Aldous Huxley: Darkness and Light, Bogart: The Untold Story, and The Unknown Peter Sellers. The film’s editor was Barbara Pokras, who cut such memorable films as The Giant Spider Invasion and The Return of The Living Dead. The music for C.H.U.D. II was composed by Nicholas Pike, who worked on scores for a number of episodes of Masters of Horror (including Pick Me Up), Freddy’s Nightmares, It’s Alive (2008), and Critters 2. The C.H.U.D. II effects team included Allan Apone (Evilspeak, Galaxy of Terror, Going Overboard, Deep Blue Sea), Douglas White (Merlin’s Shop of Mystical Wonders, UHF), Michael Spatola (Iron Man 3, Going Overboard), Bryan Moore (Dolls, Tremors II), Tim Huchthausen (Blind Fury, 1941), and John Fifer (Return to Horror High, Cyber Tracker). The cast for C.H.U.D. II includes Gerrit Graham (Child’s Play 2, Chopping Mall), Brian Robbins (Head of the Class), Tricia Leigh Fisher (Book of Love), Robert Vaughn (Bullitt, The Magnificent Seven, Battle Beyond The Stars), Larry Cedar (The Gingerdead Man), Larry Linville (M*A*S*H), and June Lockhart (Troll, Deadly Games, Lost In Space). The plot of C.H.U.D. II centers around a sole surviving experimental C.H.U.D., which was synthesized by the military from the original race of Cannibalistic Humanoid Underground Dwellers in an attempt to create a super-soldier. However, the project was scrapped, and “Bud” was left in the care of a Center for Disease Control. 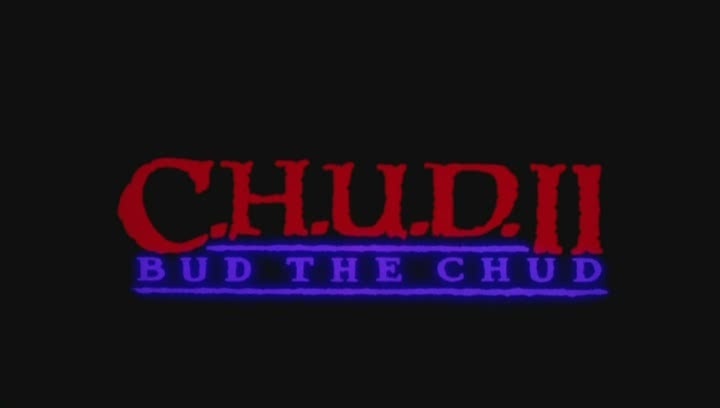 At the beginning of the story, Bud is accidentally freed by some teenagers, after which he begins creating a new army of C.H.U.D.s, and generally causes havoc for the local townsfolk. The reception to C.H.U.D. 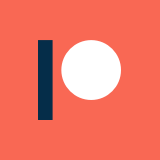 II: Bud the Chud was definitively negative at the time, though it has a bit of a cult following now. Currently, it holds an IMDb rating of 3.6, which is still impressively low. This flick astoundingly takes place in a totally different genre from C.H.U.D., and the monsters don’t look remotely like CHUDs as they were previously depicted. There is just no way that this movie was originally written as a sequel to C.H.U.D., because there are just too many dramatic differences. 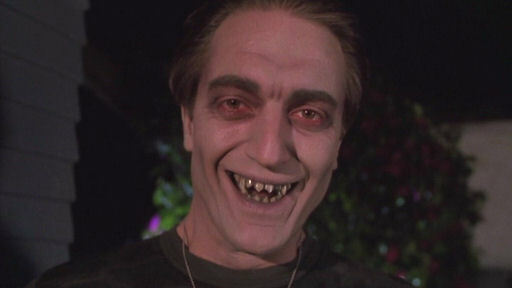 To be generous, CHUD II is to CHUD what Return of the Living Dead is to Night of the Living Dead: the movies are not really related, though the previous film is nodded at here and there in the story of the “sequel”. Speaking of which, what value was there to the C.H.U.D. name that it made sense to brand this random zombie comedy? It was a bit of a cult classic, but it was never a cash cow or particularly beloved to the point of being worth a sequel. Honestly, this makes more sense as a Weekend at Bernie’s sequel, and would probably be funnier that way. The protagonists in this movie spend a lot of time trying to use Bud to get a good grade in a science class, which fits way better in a silly comedy franchise than the sequel to grimy cannibal movie. Regarding the monsters themselves, the CHUDs in C.H.U.D. II are really unimpressive. The zombie makeup here is mostly just pale foundation, eye pits, and messed up teeth. The original CHUDs are still cheap, but they are at least a bit eerie with their contorted faces and lantern eyes. There isn’t even an attempt to recreate them here. I couldn’t very well forget to talk about the music in this movie, which is absolutely ridiculous. Bud, the Alpha CHUD, gets his own theme song, which plays constantly throughout the movie whenever the character is on screen. Speaking of Bud, the character is far more intelligent and thoughtful than it was ever implied that CHUDs could be. This may be due to him being a synthesized, experimental super-soldier rather than a natural CHUD, but I personally think that was just a plot convenience used to explain away any inconsistencies with the first film. However, it is pretty funny to think of Bud the super-soldier CHUD dressed up as Captain America. This isn’t an easy flick to recommend. It isn’t particularly fun as a comedy or as a b-movie, and clearly didn’t have a whole lot of care put into it. That said, it is certainly cheesy and hammy, and is probably worth giving a shot for bad movie fans. I just wouldn’t go in with any kind of high expectations, because this isn’t anywhere close to being a good-bad elite flick. Just in the realm of zombie comedies, there are far better options out there to dig up.